This article is about the toy Rubber Duck. For the North American bird, see Rubber duck. For generations, young children have bathed with bright yellow rubber ducks, but what parents have long supposed were nothing more than cute, harmless toys are designed for a much more nefarious purpose, animal rights advocates reveal. The features of the rubber duck are designed specifically to enhance the juvenile appearance intended by its manufacturer by mimicking an evolutionary process known as neoteny. The same process was used by artists at the Walt Disney Studios to soften the features of Mickey Mouse. 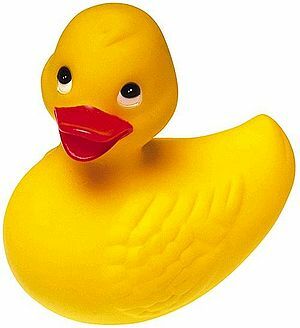 The rubber duck’s head is disproportionately large in comparison to its body because such a ratio is characteristic of young offspring, since, in the uterus, the head develops before and grows faster than the other end of the fetus. The young also have larger, lower eyes; bulging cheeks; smaller jaws; and a more prominent skull than adults. When legs and feet exist, they are shorter and pudgier than adults’ counterparts. Note: This article has been edited for sexist language under the requirements of The American Feminazi Society for Linguistic Equality and Feminine Superiority. 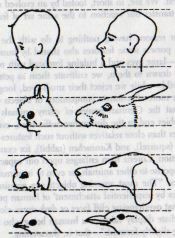 A scientist explains how neoteny was applied, over time, to Mickey Mouse, altering his appearance so that he became a cuter, more loveable character. A Wikipedia "article." As usual, the so-called "encyclopedia" gets all the significant facts wrong. Is Wikipedia a real encyclopedia or a parody? This page was last edited on 27 May 2012, at 12:45.